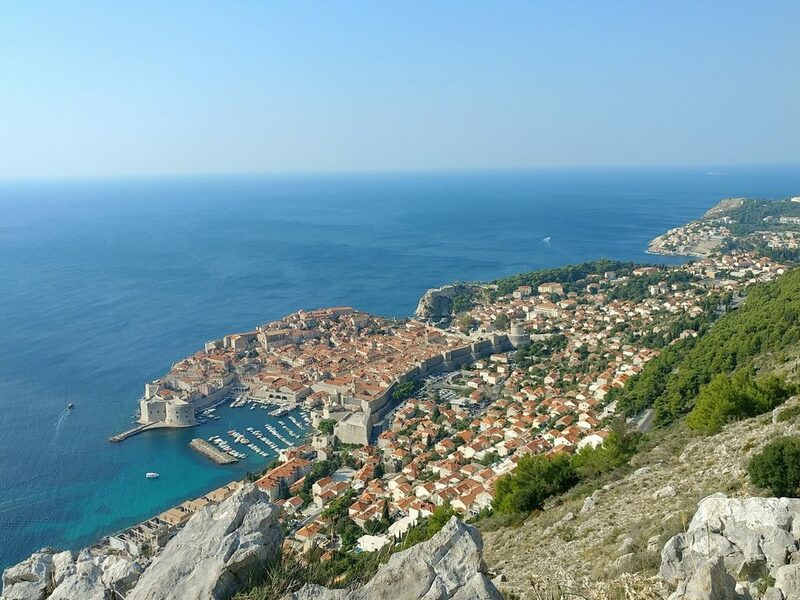 Having recently planned (and made) a trip to Croatia from the ground up, we thought we would put together some tips for those who might also be considering going there. There will, of course, be pointers about food at the end (who travels anywhere without thinking about where they are going to eat? ), but you can skip ahead to that if that is the main thing that interests you. 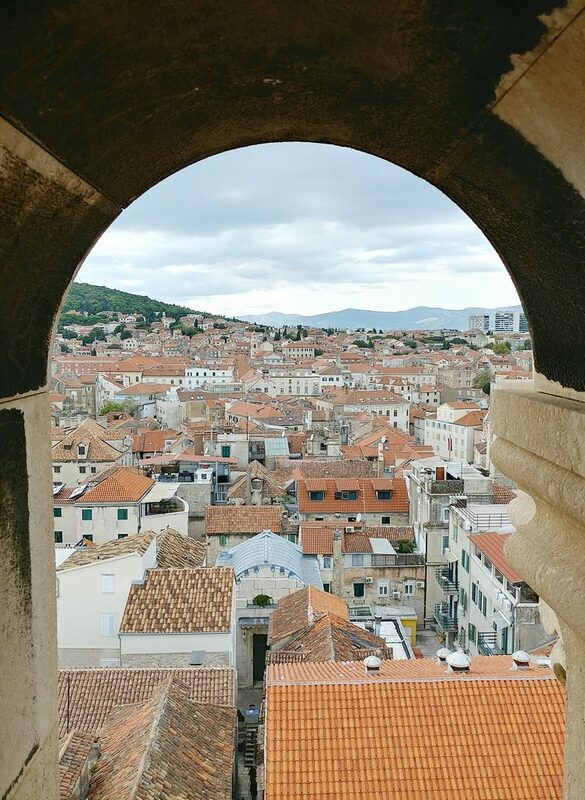 A glimpse of Split from a tower. In many things in life, timing is important. When travelling in Croatia, this is definitely true. There will be a significant difference in the experience you have if you travel at peak season compared to if you travel at a shoulder or off-peak time. We, of course, decided to avoid peak season, and were told by many of the locals we met how different it was when we were there compared to in tourist season. One instance being walking down the streets of what seemed like a sleepy little town, and then being told that in peak season, that same street would just be a river of people, packed in shoulder to shoulder. The other side to being there in the off season, is that because of the seasonal nature of trade, we did also find many places closed because tourist season was over. This was mainly in the smaller towns, but did also happen in what we thought to be larger areas. Internet sources, of course, provide no warning of this, so be prepared for some disappointment when you make the trip to some recommended eateries, only to find that they will not be open again for weeks or months. The flip side to that being that there were some popular eateries that we managed to walk into and get a meal at, when in tourist season one would have had to be organised enough to book into at least weeks in advance. 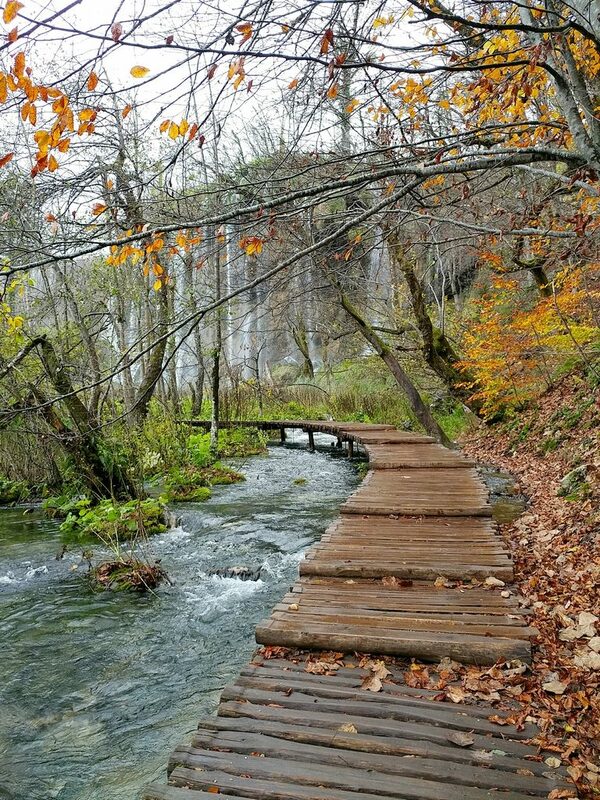 A view of a path in Plitvice National Park that would likely have been impossible in peak season. Off peak time also means that accommodation prices are lower (and places are available), and even entry to the national parks is significantly lower then. One other thing to consider when planning when to travel to Croatia though, is the weather. The reason why peak season is peak season (mainly the middle of the year) is the sunny weather. Travel in off peak season, and you risk running into less perfect weather. That wasn’t a dealbreaker for us, as given that Queensland has some beautiful beaches, that wasn’t the intended focus of our trip. We did hit some rainy patches, which made exploring some of the towns difficult (especially when combined with gale force winds – 70km/h), but were somewhat prepared with wet weather gear. It did put a dampener on some sections of the trip, but that has to be balanced against potentially facing crowds everywhere you go. What destinations you can get to depends on how much time you have. The country is narrow but long. While there are trains and buses, as well as internal domestic flights that can take you between the larger cities, to get to the smaller, and often more interesting areas, driving is the only option. What that means then, is factoring in the driving time between places. For our trip, that meant between 2 to 4 hours of driving on each of our travel days. That got us from Dubrovnik to Zagreb, with a detour to the Istrian peninsula, in two and a half weeks. In that though, we would certainly have liked more time in some locations (although most people probably think that of their holiday destinations). We tried to give ourselves at least a whole day in each location, with more in some places, and found ourselves wishing we had left more for others. 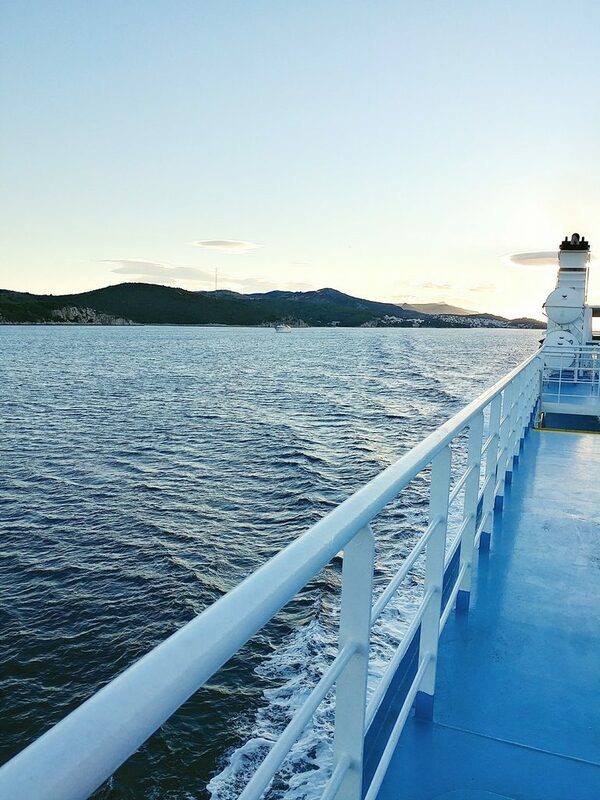 Our route, for anyone looking for inspiration for their own, was Dubrovnik –> Korcula –> Split –> Krka –> Zadar –> Plitvice –> Pula –> Rovinj –> Motovun –> Zagreb. While it wasn’t a breakneck pace, as mentioned, more time in some places would have been nice. The view from the car ferry we took to get ourselves and the car to Split. There are a number of car rental companies there, but we looked for a larger one, as we needed the option of picking the rental car up at one end of the country and dropping it off at the other. We also leaned towards an international company, due to having read about some car rental scams that have happened, so that we might have some recourse to action in case that did happen. The roads are well maintained, and with Google Maps, it is easy to get around. You just have to get used to driving on the other side of the road if you’re Australian. And be prepared for everyone on the highway to drive ridiculously fast. The speed limit on the main highways is 130km/h. Other cars frequently flew past us when we were going at the speed limit though, and were often driving far too closely behind us when travelling at speed (the concepts of physics and stopping distance do not seem to register at all). Despite some websites stating that police checks on the roads are frequent, we didn’t see any evidence of this on our journey. If you rent a car, make sure you find accommodation with parking as well. While great for getting from place to place, in many of the larger stops, the chance of finding street parking near where you want to be was pretty low. If you did manage that, it was parking you would have to pay for by the hour. In many of the old towns in particular, cars are not allowed in at all. In off peak season, there are certainly more available options, and we only finalised our accommodation plans about two weeks before leaving. If travelling around peak season, you will likely need to make plans and arrangements much more in advance, and be prepared to pay higher prices. We stated in a mix of AirBNBs, guesthouses, and hotels. As mentioned, we chose places that had car parking and were close to the old towns, so we could leave the car at the accommodation and just walk around. We found that the most hassle free way to see the sights. 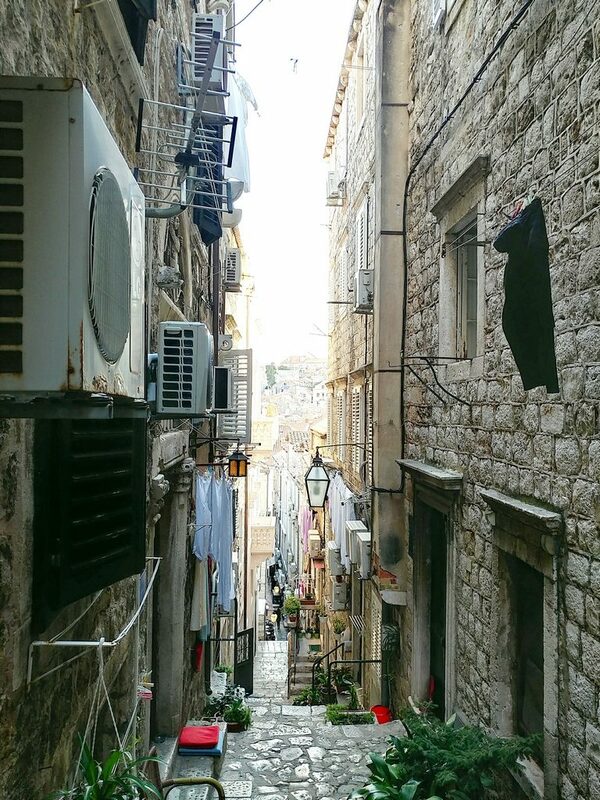 The view from outside the Air BNB we stayed at in Dubrovnik. The internet has certainly changed the way people travel. The ability to access online maps for directions, and get information about a location on the fly, is invaluable. Being able to keep in touch with those back home and update them on your travels is also a plus. If you are trying to escape the ties of work though, perhaps not so much..
Rather than use roaming on our usual plan (that is always the expensive option), we got local sim cards. Hrvatski Telekom had a great plan, which gave you unlimited internet data at 4G speed for a week, for 80 hrk (a bit under $17, at currency conversion rates at the time). It had good coverage just about everywhere we went. If only phone companies here could do that..
Unsurprisingly, food was a significant component of our trip to Croatia. There is a good deal of variation from one end of the country to the other, with different regions having their own traditional foods due to their varied influences through history. Having never been to Croatia before, our food destinations were guided by online recommendations. This proved to be somewhat hit and miss, with a number of places we went to leaving us scratching our heads as to how they garnered such high praise. We tried to go to konobas for the most part, as they are the name attached to a restaurant that serves local Croatian food. This was different in different areas, as mentioned above, but the concept is still that they make local dishes out of local ingredients. In most places, they had menus in a few different languages, so finding menus in English was never hard. 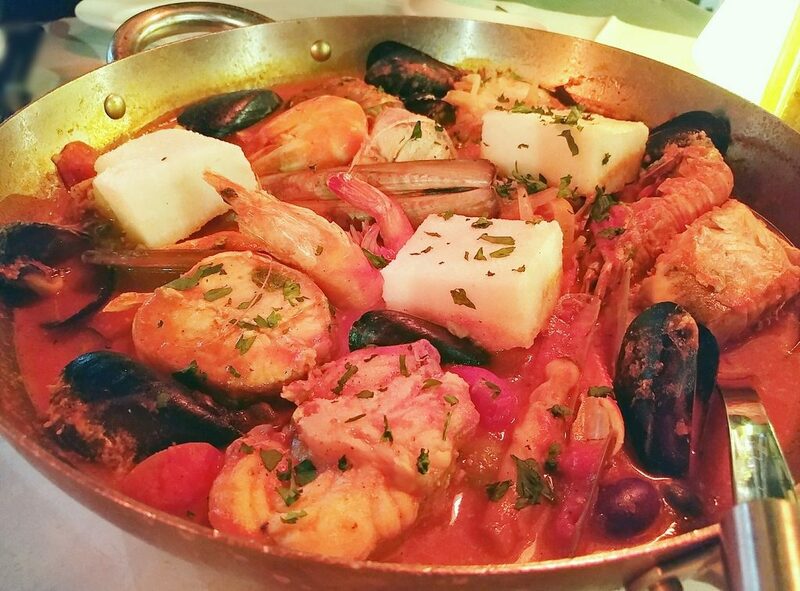 Brodet, a Croatian fish stew speciality. What follows is our take on eateries in Croatia, to give those also looking to travel there more help in narrowing down where to dine. This will be the much abbreviated version. In time, more expanded entries for places that particularly stood out will be added to this blog, and linked to from here. 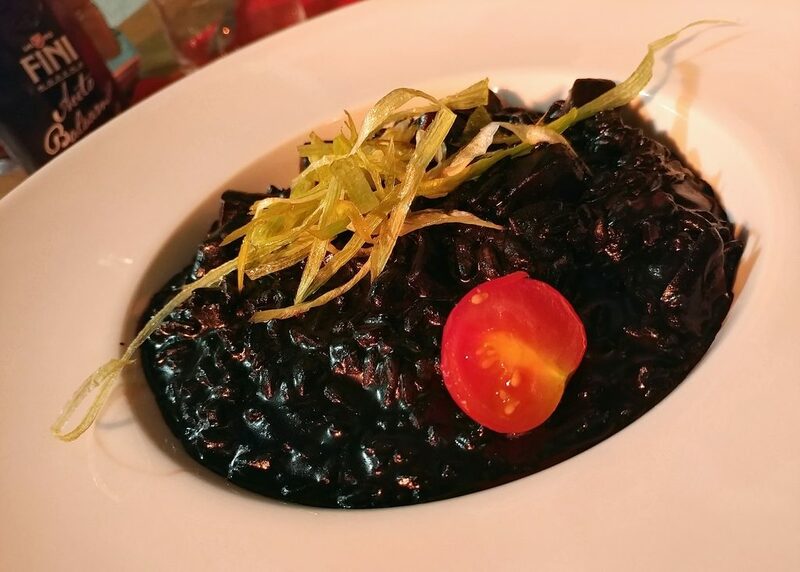 As those who follow this may already be well aware of though, eating takes much less time than writing, so the best intentions tend to be outstripped by time availability..
Black risotto, another Croatian speciality. The striking colour is from cuttlefish ink, and the cuttlefish meat is usually used in the risotto as well. One thing to warn you about when eating out in Croatia though, is that the smoking rules are a lot less lax than in Australia. If there is outdoor seating at an eatery, there is a high likelihood there will be someone smoking there. Even indoors, a number of places permit smoking while patrons are eating. This, unfortunately, means that if there is a place with a nice view outside, you will have to bear with your meal being ruined by the stench of cigarette smoke if you want to enjoy it. While a beautiful, compact city, it is also a touristy, expensive one. As one would expect, the restaurants nearer the main street (the Stradun) tend to be pricier. 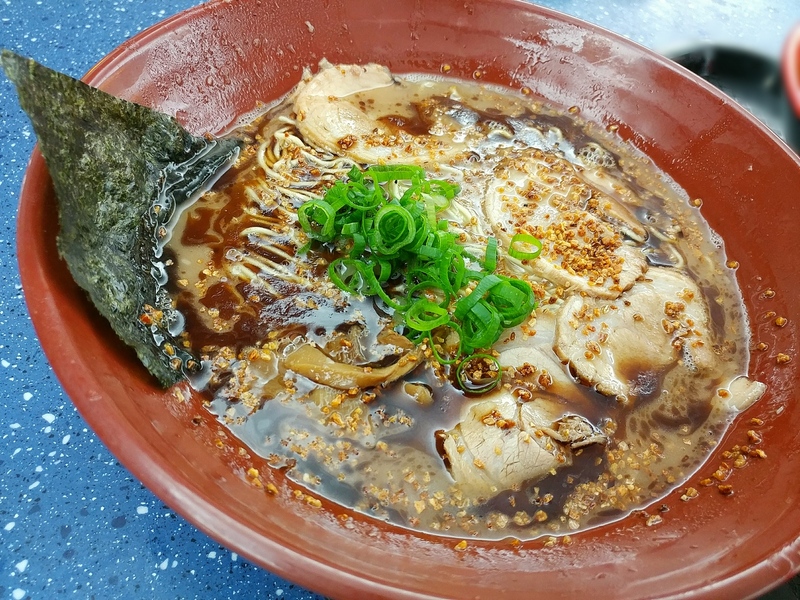 There is an abundance of eateries in the nest of streets, so we did a lot of scouting to try to find good ones (to avoid the opportunity cost of a meal wasted on poor food). 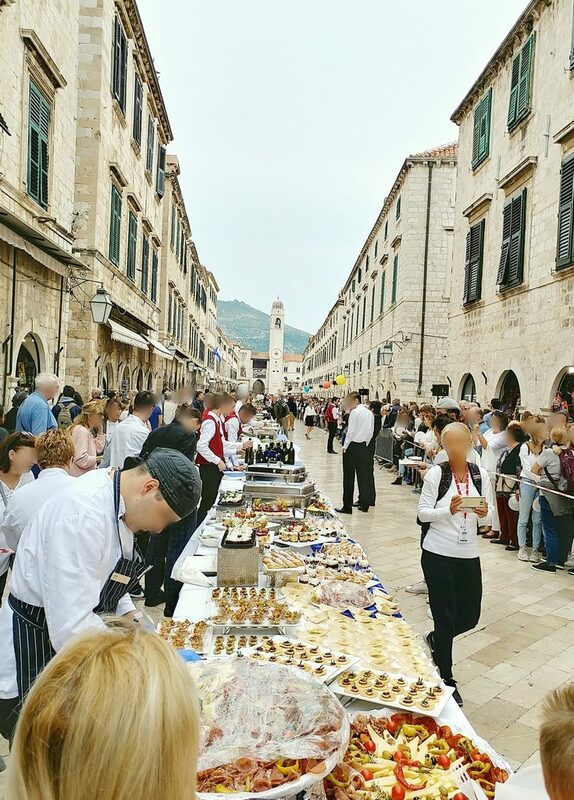 We happened to be there when the Good Food Festival was on in Dubrovnik. This was the Dubrovnik Table, held on the last day, where restaurants put food on a long table that runs down the main street..
Barba: Despite being praised in various other writeups, we found this eatery a giant letdown, with their much lauded octopus burger filled with what was more like a processed vegetable patty, and for what converted to about $15 AUD per burger, it was hugely underwhelming. Konoba Jezuite: Located in a quieter section of the city, near the Jesuit Church (hence the name), this was one of the standout meals we had in Dubrovnik, if not the trip. Their black risotto (a must eat Dalmatian dish), was the best we had, with nuanced flavours. Restaurant Kopun: Located right beside Konoba Jezuite, it focuses on the flavours of traditional Croatian cooking. This too was very good, and the brodet (fish stew) in particular was tasty and had a generous amount of seafood. We found our time on this island tranquil and more relaxed, quite a change of pace from Dubrovnik. 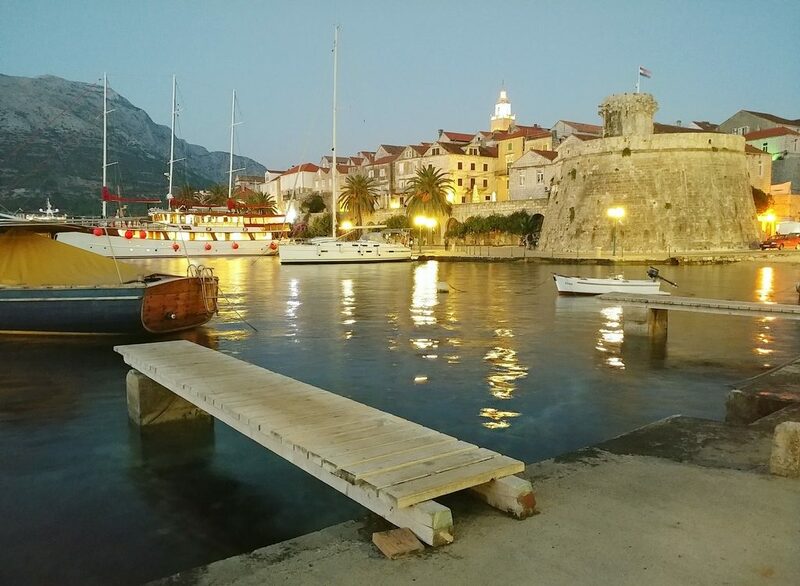 A look at the old town area of Korcula. Traditional cakes Skatula: A local shop that makes cakes and traditional biscuits. The prices were very reasonable, and the cakes were very good. 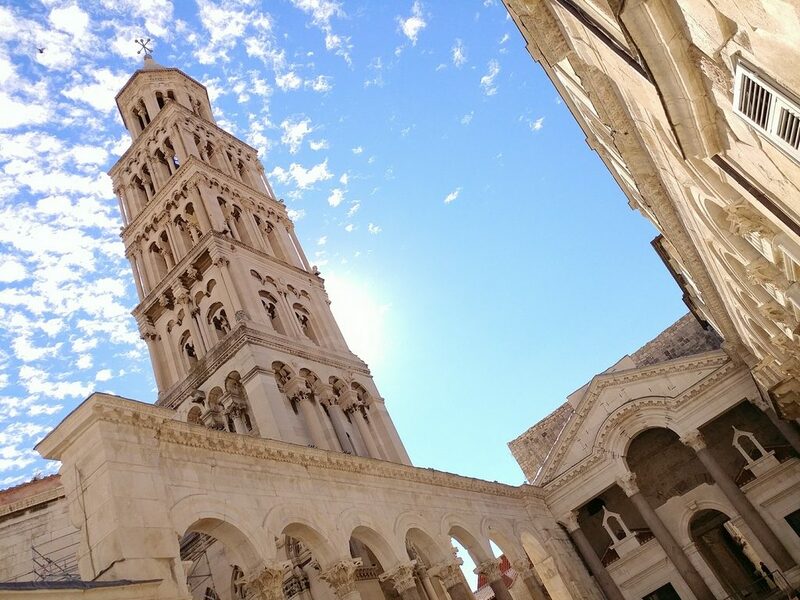 There is a lot on offer in this city, both within the walls of the Diocletian’s Palace, and just outside it. We found there to be more variety here than in Dubrovnik, and it was a bit less pricey. Some of the buildings at the core of the Diocletian’s Palace grounds. 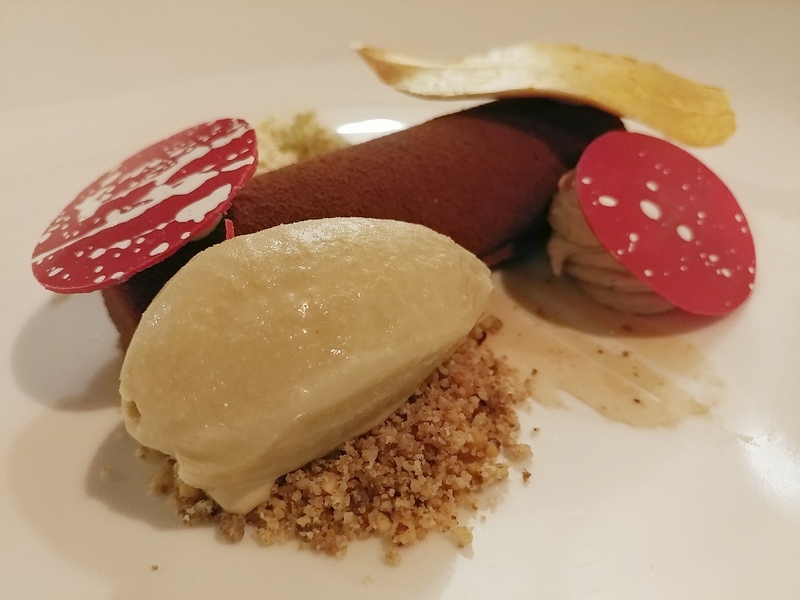 Corto Maltese Freestyle Food: We loved the tongue-in-cheek styling of this place. 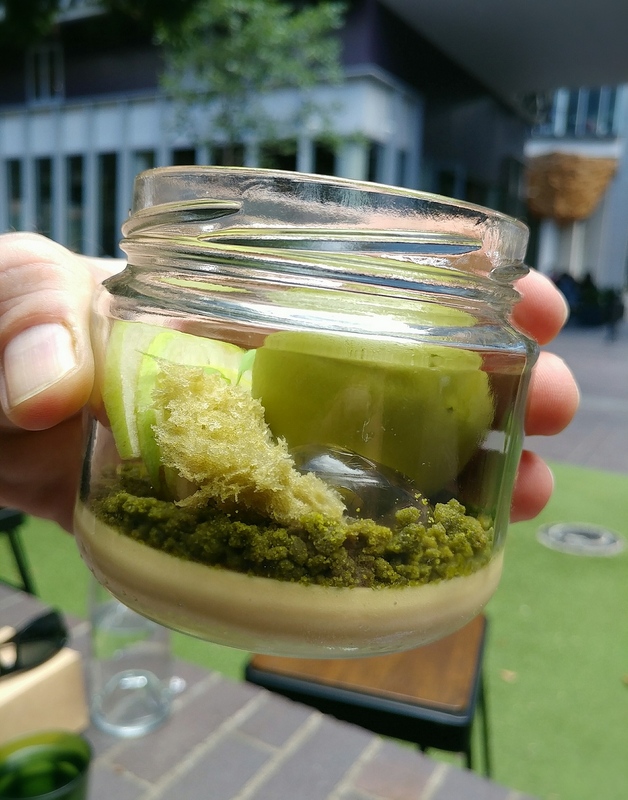 They had a creative, modern take on Croatian food, but they know how to work with flavours, and it was certainly tasty. Konoba Korta: They stick to a more traditional take on traditional Croatian food, with their special dishes in signature red crockpots. Our experience of this city was coloured by the heavy rains that pelted it through much of the time we were there. That meant more indoor exploration, like the interesting Archeological Museum, and eateries. The Sun Salutation was, unfortunately, out of order. The Sea Organ was working though, and perhaps louder because of the strong winds and waves. 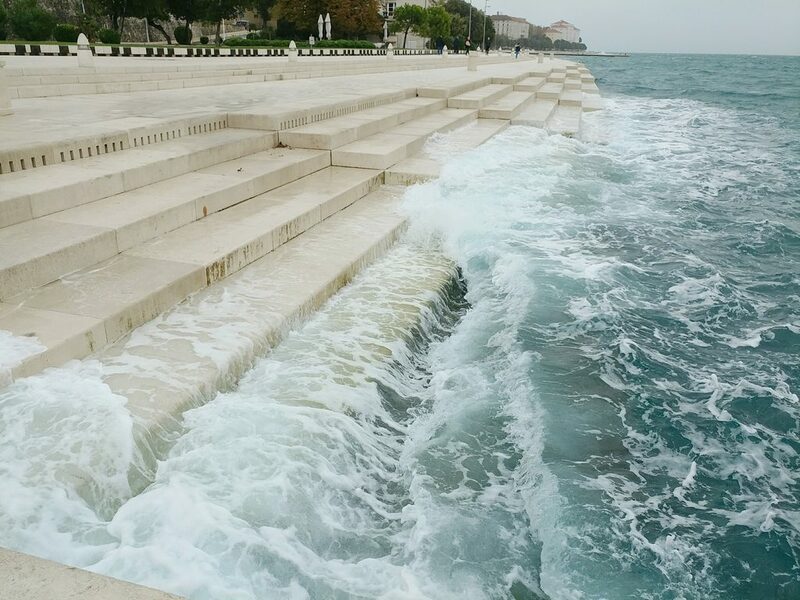 The famous Sea Organ of Zadar. It makes mournful sounds as the waves push air through it. Art Kavana: They have house-made cakes in a variety of flavours in a prettily decorated setting. Coffee & Cake: Another cafe with good house-made cakes, but this has more modern styling..and free wifi. Pet Bunara: The restaurant has a slow food philosophy, and its menu changes with the seasons. They make their own bread in-house, as well as their own vinegar. Restaurant 2Ribara: Reasonably priced food in a modern setting. They specialise in seafood, and the Fish Platter gets you white fish, calamari, scampi, tuna, swordfish, and mussels. This town on the Istrian peninsula had a surprisingly large number of well-rated restaurants for its size, and certainly had the feel of a seaside resort town, although many places were closed post tourist season. 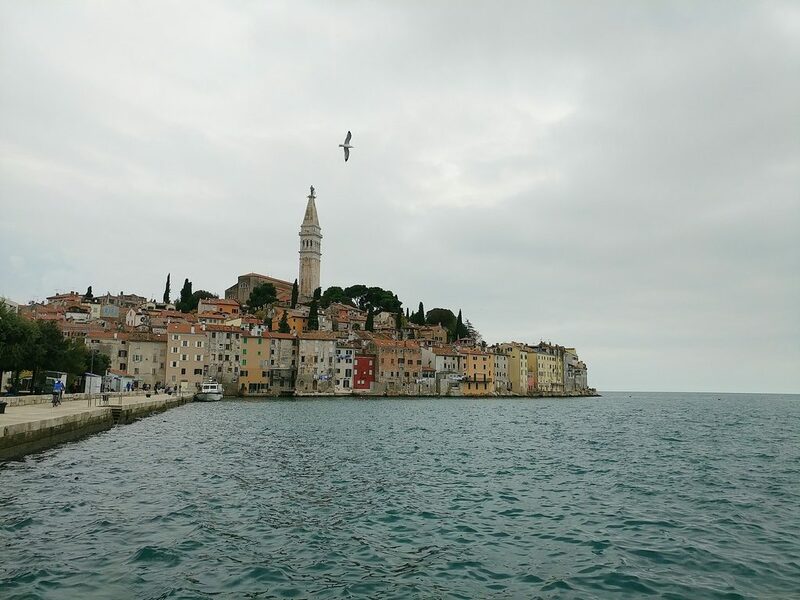 The compact old town of Rovinj. Brasserie Adriatic: Awarded two toques by Gault-Millau, this was one of the better dining experiences we had on the trip. It is linked to the Hotel Adriatic, but is more than just another hotel restaurant. The food and service were finessed, without being fussy. La Puntulina: Also awarded two toques by Gault-Millau, this restaurant has an unassuming appearance (apart from the many prize stickers on the door), but a great view out over the water. The entrees and desserts were very good, but we were a bit underwhelmed by the mains for the price. This walled town on the top of a hill is a picturesque place. Only residents can drive and park in the town, but if you have accommodation in the town, they have quite an organised setup in which lower down on the hill, people direct you to where you can park, and contact the accommodation, that then arranges for you and your luggage to be picked up in another vehicle, and brought right to the accommodation (also easier than dragging your luggage up the cobblestoned streets the entire way). This is supposed to be the heart of truffle land, as they grow well in the forests of Motovun at the foot of the hill. A view from the walls of Movotun, which you can also do a walk around. Konoba Mondo: This eatery became more well known after Anthony Bourdain dined there in an episode of No Reservations. We went there to have an assortment of truffle dishes, it being truffle season, and the eatery being known for them. Sadly, it didn’t live up to expectations. Restaurant Fakin: Nice views of the surrounding area from the outside seating area, but service was terrible (struggled to get anyone’s attention to get a seat, then to get a menu, then to order, then food took a very long time to be served), and the truffle pastas we had lacked truffle aroma and were expensive. 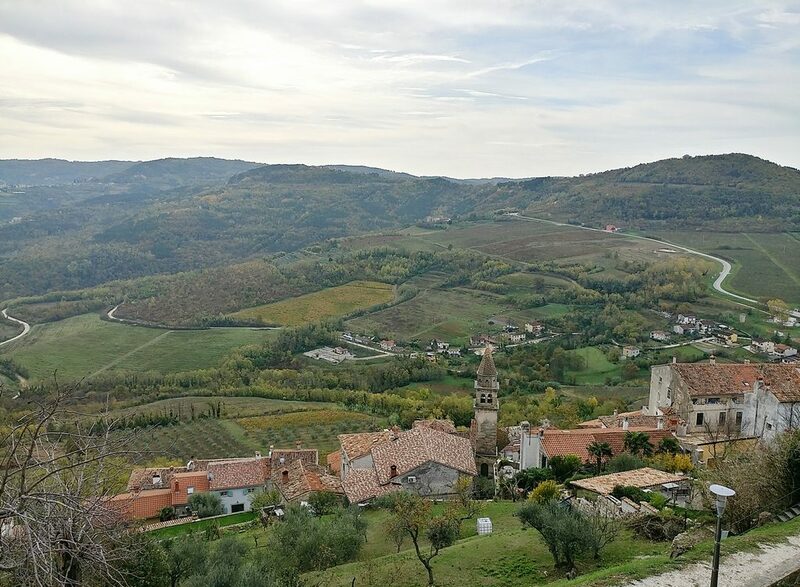 We had been on the Istrian peninsula to go to the truffle festival in Livade (Zigante Truffle Days), and found out that that, serendipitously, was also the weekend that the festival of Istrian truffles was on in Buzet, so had to visit. Between the two, we actually enjoyed the festival in Buzet more, as it had different truffle vendors as well as vendors of other local specialities there, whereas the Zigante Truffle Days event was mostly products just from Zigante Tarfuti, and less varied. 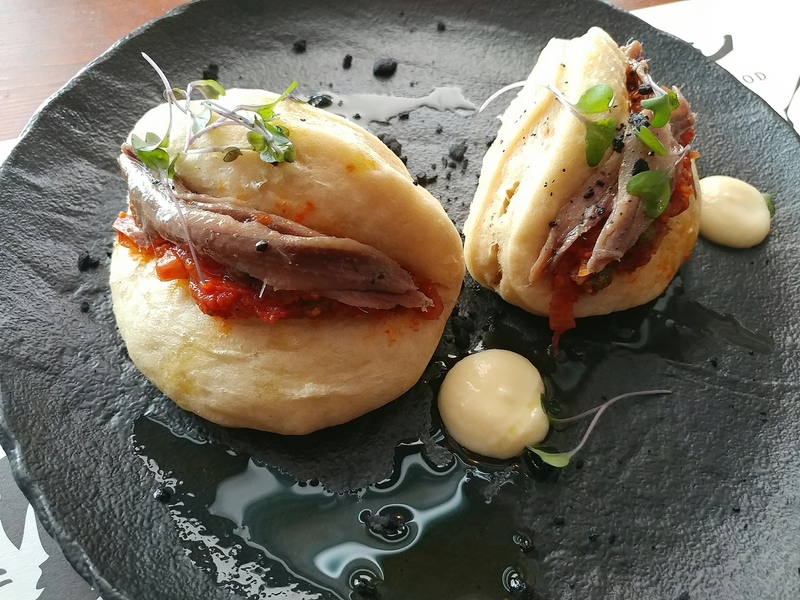 Konoba Vrh: The restaurant is in a quiet are that seemed out of the way, and when we drove past it on the way to the festival, wondered who stopped there. Then we followed the Google reviews there, and thought the food delicious too. The setting is homely and rustic, but they can cook. From what we had read, we expected the capital of Croatia to be just another large urban city, but it had its own character and charm. There is certainly an abundance of galleries and museums, including quirky ones like the Museum of Broken Relationships. Those who have been tormented by the bitter Viennese-style bitter coffee and long for third wave coffee will finally be able to find it here as well. 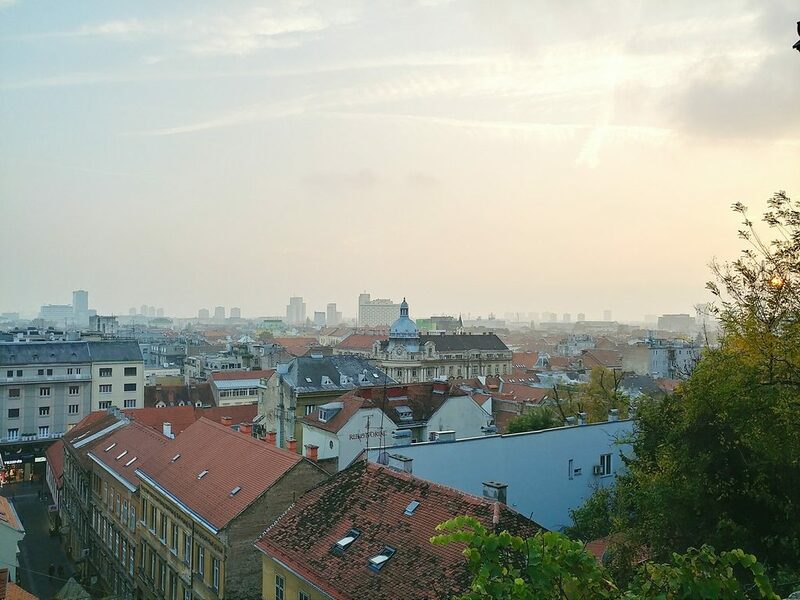 A look out over the city of Zagreb as the sun sets. Cogito Coffee: They have third wave coffee in a Melbourne cafe-like setting. There are non-dairy milks as well. 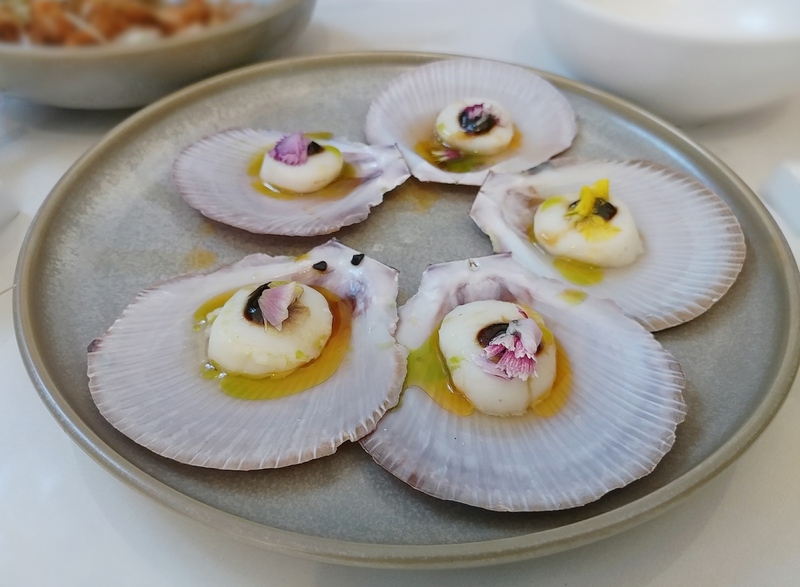 Dubravkin Put: We had the seven course tasting menu at this Michelin-plate restaurant, and enjoyed the artistry of the food. It was a lovely setting, and the service was polished but warm. 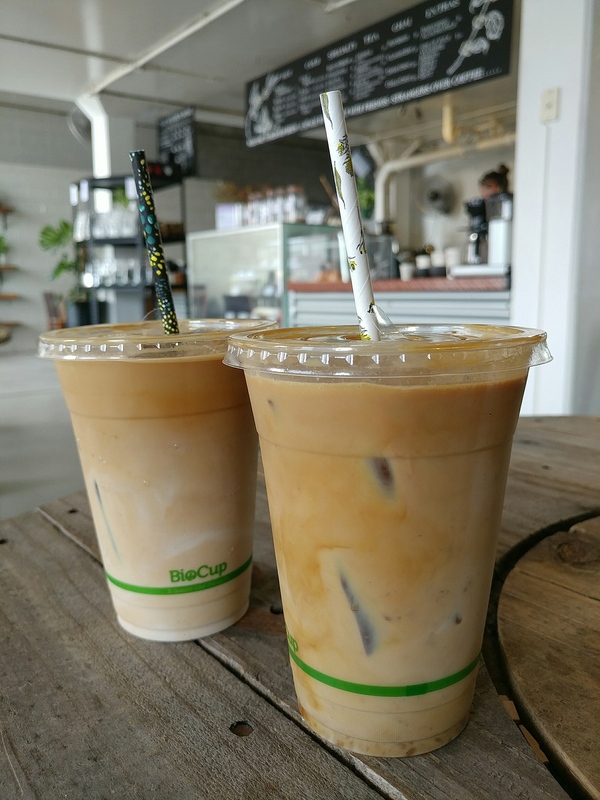 Express Bar: Go here for third wave coffees with non-dairy options (almond milk). Le Struk: All this casual eatery serves is strukli, a traditional Croatian homemade dish. Essentially dough filled with a variety of savoury or sweet fillings, it turns out a bit like a pasta bake. Tasty, filling, and easy on the wallet, this is certainly worth the visit. Be prepared to wait at least 20 minutes for the baked ones though, as they cook them to order. Meet Mia: They have a variety of pretty and delicate French-style entremet cakes, buttery plain croissants, and filled croissants (like raspberry and vanilla) that we wish we got more of. Hopefully, we have provided some useful tips for your trip to Croatia. For those who haven’t considered visiting Croatia before, this may give you some impetus to think about it. It is a country rich in history, beautiful views, and cuisine. As mentioned, more links and detailed information about food places will go in, so check back again, or sign up for updates so you are notified when more posts about them are done. Happy travel planning! Dubrovnik again, seen from higher up.